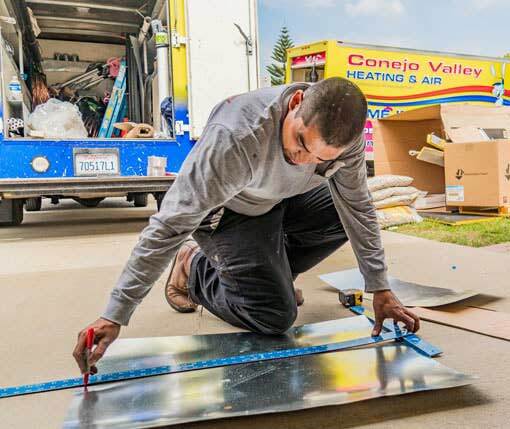 Conejo Valley Heating and Air Conditioning Inc. offers 24-hour emergency HVAC repair services for air conditioner, water heater, heat pump and furnace repair service Santa Barbara, regular or routine maintenance and installation services in Santa Barbara, CA. Whether you live in Santa Barbara year-round, or just for the winter, you know how much you rely on your air conditioning, heating, and ventilation (HVAC) system. 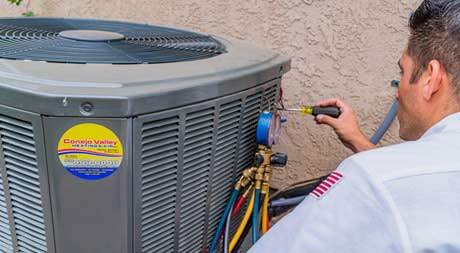 Unfortunately, there are a lot of air conditioning and heating contractors in the Santa Barbara area that says they can competently service, repair or replace your air conditioning or heating system. Not all of them can. We believe we’re one of the best. Read on to learn more about us and what we can do to help keep you comfortable in sunny Santa Barbara. 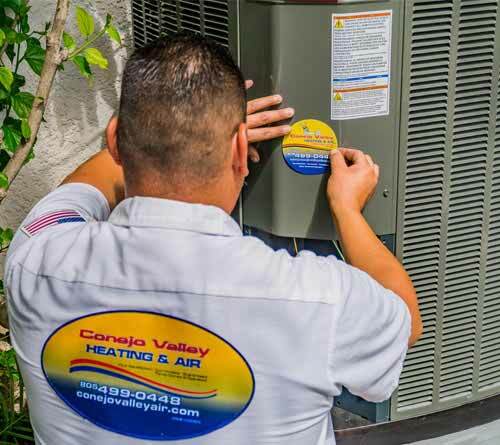 Why select Conejo Valley Heating and Air Conditioning if you’re in the Santa Barbara area? We’ve been providing AC, heating, ventilation and water heater service in Santa Barbara for over 30 years. We guarantee a fast emergency response time to anywhere in the Santa Barbara area. We’re on-call 24 hours a day in Santa Barbara, seven days a week, all year long. If your heating system, furnace, heat pump or water heater is making strange noises or running at a turtle’s pace, or not at all, you need professional heating repair…and you need it now! 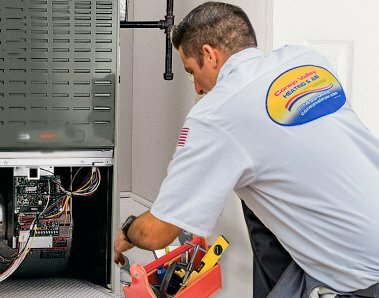 When you need Emergency Heating System Repair, our expert technicians are at your service 24 hours a day, seven days a week, wherever you are in the Santa Barbara area. Plus, all calls are answered by one of our qualified and courteous technicians, not an answering machine or service. At Conejo Valley Heating and Air Conditioning, we charge by the job, not by the hour. Our factory trained AC and heating technicians put extra care and attention into servicing and repairing your central air conditioning, heating, and ventilation system or water heater. We treat you and your property with respect, too, by calling before we arrive at your property and by providing an honest upfront free estimate that you approve before any AC or water heater work is performed. 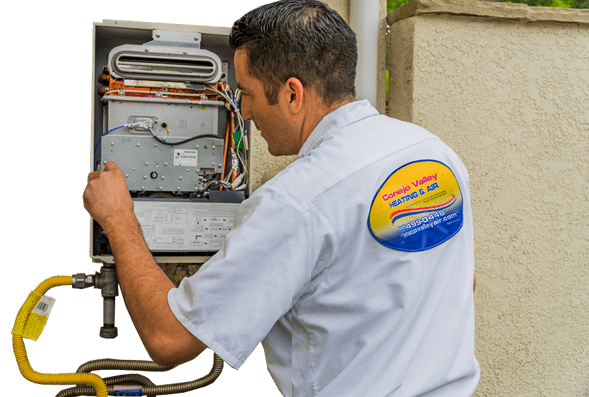 We service any type of home and light commercial air conditioning and heating system in Santa Barbara, including all AC and heating (including heat pump) and water heater equipment, makes and models. Our vehicles are fully stocked with HVAC parts for fast and convenient heating and cooling repairs. Email us today for more information or, better yet, give us a call at (805) 499-0448 to schedule a Tune-Up at your Santa Barbara location. You can perform some quick checks before you call us to come to your Santa Barbara location, to see if it’s something that you can handle yourself. If the air conditioning system is not running at all, check the settings on your thermostat. Make sure it’s not turned to the “off” position. Is it turned to the “AC” position and is it set for a cooler temperature than the room temperature so it will trigger the air conditioner to turn on? Conversely, if you’re not getting heat, is the thermostat turned to the “heat” position and is it set for a warmer temperature than the room temperature? Has a fuse or breaker flipped off? If none of these checks solve the problem it’s time to call the experts at Conejo Valley Heating and Air Conditioning. Living in sunny southern California, you know how much you rely on your air conditioning, heating, and ventilation system. That’s why we developed our unique maintenance process. It covers everything that can possibly be done to keep your air conditioning, heating and ventilation (HVAC) system or water heater operating at its peak performance, so you’re always comfortable in your Santa Barbara home or business. We also include a free inspection of your ductwork to make sure there are no leaks and that the air you breathe is free of dirt and mold. We offer this inspection at no additional cost because your indoor air quality plays an important role in the health and enjoyment of your Santa Barbara home. Act now to get our comprehensive maintenance plan. Contact us today to schedule a maintenance call at your Santa Barbara location. 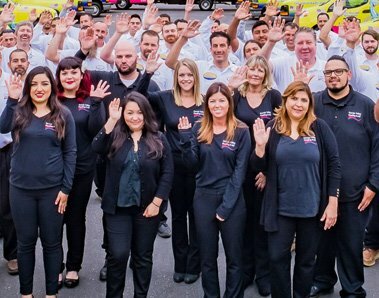 With over 30 years of AC and heating experience, satisfied customers in the Santa Barbara area and a licensed, insured HVAC team trained to the highest level, you can be sure you are choosing true professionals in the air conditioning and heating business when you choose Conejo Valley Heating and Air Conditioning. Our role is to help you design an indoor comfort system that best fits the personal needs of your family and structural characteristics of your Santa Barbara home. We will walk you step-by-step through all your options so you can make an informed and educated decision while selecting your new AC system. We will help you select a cooling and heating system that is right for the dry climate and temperature swings of Southern California and the size of your Santa Barbara home. We only offer AC systems and water heaters that are energy efficient, quiet, reliable, durable and guaranteed.